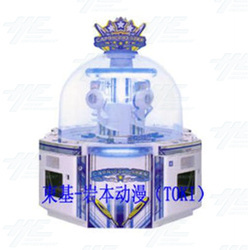 Capriccio Star is an eye catching crane machine with dome design from Taito, especially for 4 players. It comes with sharp lighting effects around the playfield, and with two different kinds of claws for variety of prizes in each independent play field. It comes with sharp lighting effects around the playfield, and with two different kinds of claws for variety of prizes in each independent play field.